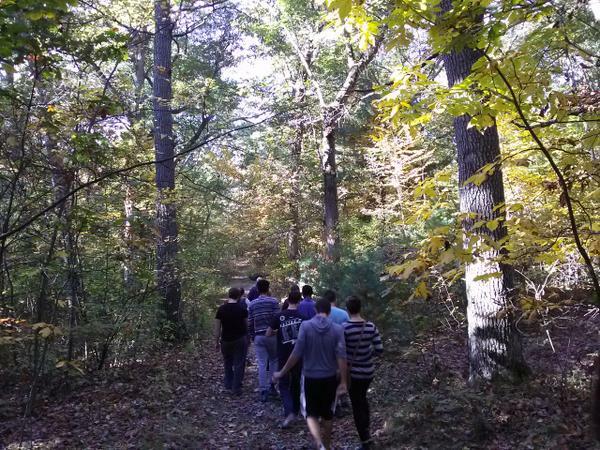 Mr. Ambrose's junior honors English class enters the Fells Reservation, adjacent to Medford High School, Fall 2014. Under the leadership of Dr. John Perella and through a partnership with various community organizations such as Eagle Eye Institute, Medford High School has embarked in recent years on a journey to pursue greater opportunities for outdoor education. I will use this space to share lesson plans, ideas, and blogs involving outdoor education at Medford High School and beyond. 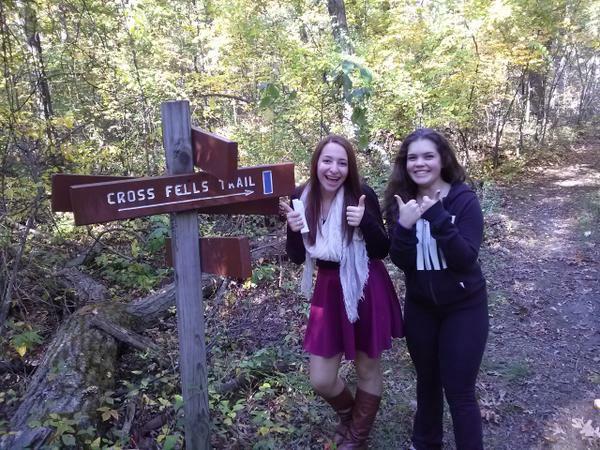 Click here to read an article about Fells Day at MHS! Click on the link above to access information about a Faulkner-themed hike, as well as student work samples (writing, illustrations, and photos) from the 5.17.16 hike. When I took my juniors on a hike in the Fall, I had small groups of students find a place along the trail to convene and talk about the quotes on this sheet. These quotes, from Henry David Thoreau, speak to the importance of outdoor education in some way. Each group discussed a different quote and then returned to the large group to present and discuss their findings. 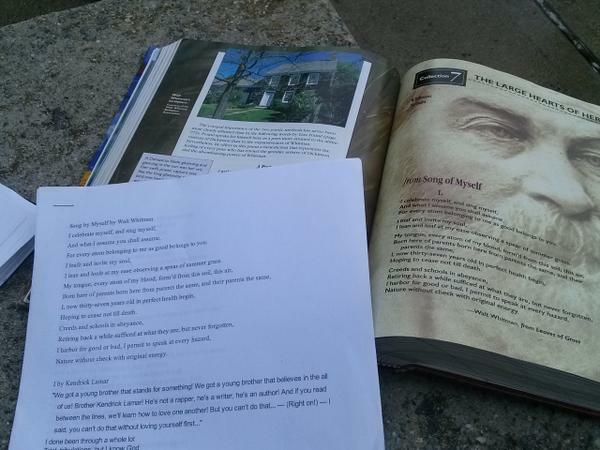 I encouraged students to make connections to the Transcendentalist works we read in class. I prepared this handout for a professional development day at school last year. It includes a quote from a student (Nicole Mortell '15) as well as two potential activities to do with students while on the trail. This sheet incorporates opportunities for writing a journal as well as writing an original poem based on Whitman's style. Want Your Kids to Go to Harvard? Tell them to go outside! This blog post might be an interesting nonfiction piece to read with students before or after they go outdoors, as we evaluate the merits of outdoor education. This collection of nature readings, titled A Walk in the Woods near My School was inspired by the Woodlands and Wetlands Book of Readings from Essex Agricultural and Technical High School, graciously loaned to me by CCEP member Charlie Saulnier. This collection, compiled by myself and my student Brenda Quach '15, contains excerpts from writers such as Henry David Thoreau, Walt Whitman, Barbara Kingsolver, Dr. Seuss, and many others. I invited students and parents to suggest their favorite nature readings for inclusion in this collection, and my goal is to continue to add to and subtract from it each year as we read from the anthology during our nature hikes. The student as the citizen scientist (use in conjunction with "Thoreau Rediscovered as a Climatologist" article"
Their motto is, "When you have the choice, choose outside." I am endeavoring to go outside for 1000 hours this year with my three-year-old son, Ben. Will you make the pledge as well? This is a program that we should try to get some MHS students involved in. Lots of positive opportunities for current students, as they are introduced to possible careers in the outdoors. From their website: "'Foxfire' is a method of classroom instruction—not a step-by-step checklist, but an over-arching approach that incorporates the original Foxfire classroom's building blocks of giving students the opportunity to make decisions about how they learn required material, using the community around them as a resource to aid that learning, and connecting the students' work with an audience beyond the classroom.﻿"
Amani and Molly on the trails during period 2 English class. 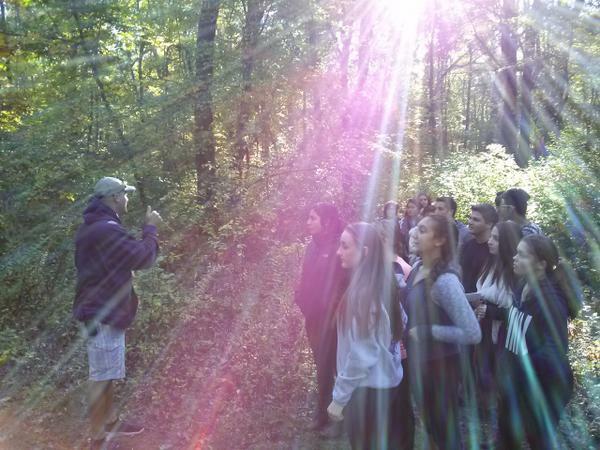 Mr. Matthew Galusi of the Physical Education Department tells my students a bit about the history of the trails in the Fells. 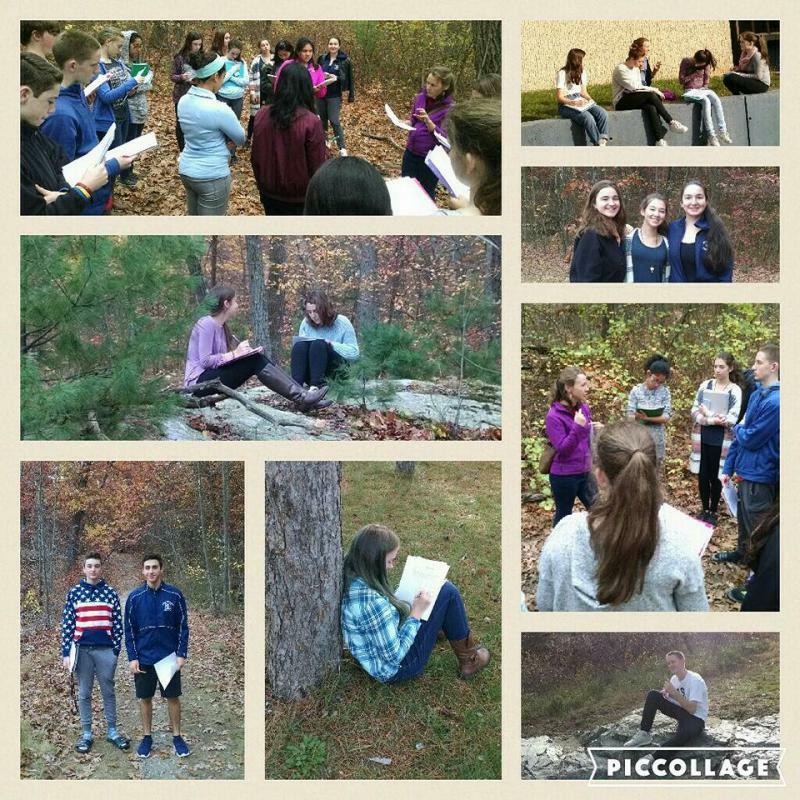 There are myriad connections students can make in the outdoor classroom. For example, these students taught there classmates about thematic connections between Walt Whitman's canonical poem "Song of Myself" and Kendrick Lamar's contemporary rap song "i." Using the Northwest Courtyard as a outdoor classroom-in-the-round, MHS students can get outside to learn without taking too much time to travel to the destination.